Is There Any Empathy Left In The Israeli-Palestinian Conflict? : Parallels A generation ago, Israelis and Palestinians routinely rubbed shoulders. But they have become increasingly segregated and the current fighting has only added to the friction between Arabs and Jews. Is There Any Empathy Left In The Israeli-Palestinian Conflict? 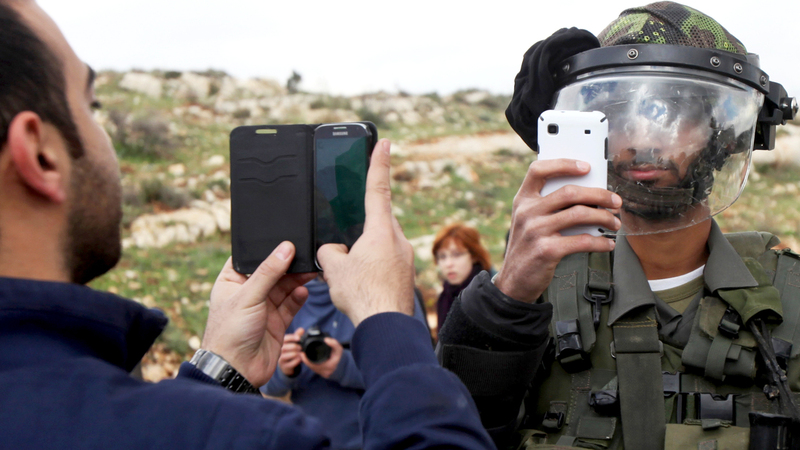 A Palestinian man and a member of the Israeli security forces take pictures of each other with their mobile phones near Ramallah, in the West Bank, on March 14. Israelis and Palestinians used to have regular contact, but today they are increasingly segregated. In the waiting room at Jerusalem's Hadassah Hospital, an Israeli woman was shouting at a Palestinian mother whose son was being treated for a beating he received from a Jewish mob. "Go away you trash," the Israeli woman yelled at the Palestinian. "I would bury you in Gaza." A second Israeli woman joined in the verbal barrage, complaining that her taxes shouldn't be paying for Palestinian treatment. Two other Israeli women came over to comfort the Palestinian mother. But she is in no mood for reconciliation and retorted: "What good will your apologies do?" My NPR colleague Daniel Estrin witnessed this exchange and it reflects the lack of empathy in Israel, the West Bank and Gaza these days, even in the few communities where Jews and Arabs mix like Jerusalem. Menachem Klein, a Bar Ilan University professor of political science and one-time adviser to the Israeli negotiating team back in 2000, says the abstract view many Jews and Arabs have of one another has brought the conflict to a new low, one that's about ethnicity rather than statehood or disputed borders. "It's very easy to move from a person that you know, that you see the face and the suffering and everyday care and concerns — a human being like you like me — and an abstract, a general enemy, a demon," he explains. Klein says the perception is something that has been reinforced by Israel's policy of separation, which started during the first Palestinian uprising or intifada nearly a quarter century ago when Israel started setting up road blocks. It mandated a permit system on Palestinians in particular, whose movements within their own territory and to and from Israel and even Jordan and Egypt were strictly controlled by Israeli authorities, the professor says. 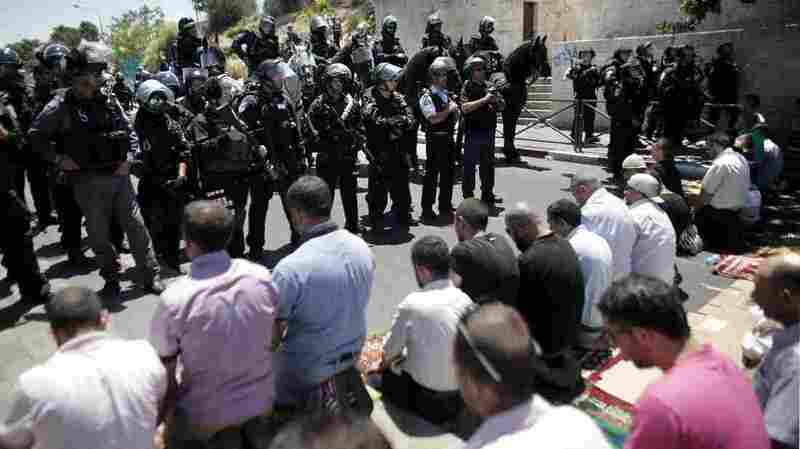 Members of the Israeli security forces stand guard as Palestinian Muslims perform Friday prayers on a street outside the Old City of Jerusalem on Friday. The segregation intensified during the second intifada that began in 2000, leaving Israel, Gaza and the West Bank physically isolated from each other, often by heavily guarded fences and walls. Big red signs were erected on borders to Palestinian territory warning Israelis that it's illegal for them to go there, Klein says. "So for safety of the Israeli Jews, the regulation came in force," he said. "The problem is that it cuts off many connections personal relations between Israelis and Palestinians." Hind Khoury, who is a former Palestinian Authority Minister of Jerusalem Affairs, says most younger Palestinians have never interacted with Israeli Jews other than soldiers. Nor have they traveled to any cities or towns where Israel controls the borders, even though some are only a short drive away. "I know for a fact that in Bethlehem, we have a whole generation of young people who don't know East Jerusalem, which is (less than five miles) away, I mean who don't know the holy sites" other than from a book, she says, adding: "This is 'Absurdistan' in its full sense." The separation affected the workplace as well. As Israel shut the door on Palestinians, it brought in other foreign workers to do the agricultural and construction work Palestinians once did. Israel's Central Bureau of Statistics shows the 116,000 work permits issued to Palestinians in 1992 dropped to 11,500 in 2005. It did rise somewhat in 2012 – the most recent number available – to 30,000. Israelis continue to want that separation, says Tamar Hermann an Israel Democracy Institute senior fellow who specializes in public opinion polling. "When we ask if peace prevails, would you like to see Palestinians come back? And they say 'no,'" she said. "My own children, I suppose, they have never met a Palestinian," Hermann adds. "They've never visited a Palestinian village, they never went to Ramallah they never went to Jericho. And this is why they imagine things and this imagination normally is not positive under the circumstances of conflict, a protracted conflict in particular." Khoury, meanwhile, criticizes what she sees as a collective Israeli disinterest in connecting with the Palestinian side. "I call them the 'Road 6 Israelis,'" she said. "They cross Road 6, which goes along the Green Line (dividing Israel and the West Bank) and the wall that was built to separate us." Khoury accuses these Israelis of being completely unaware of what Palestinian life is like. "They have their holidays, their consumption, their good life and their beautiful homes. So what does it matter that we have practically no homes left or no lands left," she complains. Back in Jerusalem, the generational difference in empathy for the other side is striking in the walled Old City, which has Arab and Jewish neighborhoods. Jamila is a 48-year-old Arab homemaker, and fearing retribution, asks NPR not to give her or her children's last name. The air is thick with tension in the crowded alley of the Muslim Quarter, where stern Israeli policemen keep watch and settler flags flutter off several rooftops. Jamila says she's worried about the current ethnic tension, but views her relationship with Jewish residents of the city as "normal." She even chats on the phone with her 23-year-old son Sami's Jewish girlfriend – a relationship considered scandalous on both sides here. Jamila says while she doesn't have Jewish friends, she shops at Jewish-run stores and goes to Jewish doctors. She says hello in Hebrew to her settler neighbors. Her daughter Nadia says she doesn't speak Hebrew and avoids contact with Israeli Jews. Nadia is listening nearby and looks somewhat annoyed with her mother. Soon, the 26-year-old and another sister are arguing with Jamila. Nadia says: "Israeli Jews are bad human beings. They kill every day." When Jamila tries telling her that not all of them are bad, Nadia cuts her off and says: "Our principles do not allow us to kill the way they are killing." In the hilly Jerusalem suburb of Moza Illit a short drive away, the sentiment Shakhaf Vahaba expresses is similar, but in reverse. Vahaba, 24, believes Palestinians won't rest until they oust all Jews from Israel. "I think they hate us because they are taught to hate us," says Vahaba, who helps her mother run a day care center. They have moved it to a community center with a better bomb shelter to protect against the repeated Hamas rocket attacks. Vahaba says she is not sure that she's ever met a Palestinian, and adds that she rarely speaks with Arab college classmates. She says an Arab student who recently posted on Facebook that she wished all Israeli soldiers would die caused an uproar that led to the girl being banned from campus. "I think it made them feel she is enjoying ... the benefits and then spitting into the well she's drinking from," says Vahaba's mother, Dalit. Dalit Vahaba, 51, says her daughter's views are in part shaped by a traumatic childhood during the second intifada when bus bombings and mall attacks in Israel were commonplace. The mother, on the other hand, remembers driving to Gaza with her father when she was a child, and dining on chicken and rice platters at home of his Palestinian friends in Ramallah. As a young woman, she worked at a Tel Aviv café, where she and several other Israelis befriended three Palestinian co-workers from the West Bank. The three Palestinian men even came to her wedding and visited her after her daughter was born. But the intifadas and ensuing segregation have taken a toll on the relationship. She says she never saw her Palestinian friends again save for a brief reunion in Israel last September. "I think we were aware of the problems even then, but I think then we had more hope," she said. "I thought there can be peace between us and we can live together and everything." Vahaba says she doesn't believe that anymore. In Ramallah, Ghassan Abdullah, who heads the Center for Applied Research in Education, says it's going to be very hard for Palestinians to come to terms with Israelis as well after its army's deadly offensive in the Gaza Strip. "It's easy to cure a physical injury, it's easy to rebuild a house, but as a psychologist, I'm telling you, (overcoming) the psychological barrier will take years or decades."